Halifax coach Richard Marshall said Thursday night’s Challenge Cup loss at Featherstone can act as a wake up call for his team as the battle for the Championship top four hots up. 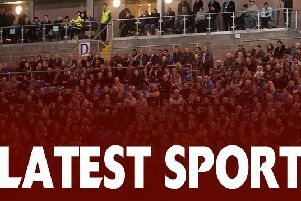 Fax went out of the competition at the sixth round stage as Jon Sharp’s Rovers won 24-12 in front of the Sky TV cameras, ending their visitors’ seven-game winning streak. Marshall’s side were left hanging on for long spells as Rovers - who are only two points clear of Fax on the league ladder - played with a speed and intensity their visitors could not match, with only some heroic defence preventing a heftier reverse. “It’s probably done us a favour,” said Marshall, who has the consolation of knowing his side will not now face the midweek league fixture that would have been the downside of a quarter final spot. “We know the level we need to be at now if we want to be the top four team that we want to be and aspire to be. “It’s made us a little bit harder and we know now that we need to play at a different tempo, I think. “Featherstone probably played at a different level, not for all the game but for large parts of it. “Their defence was really good; they were driving us back on tackles one and two and we couldn’t really get any momentum because of that. “We will look at that, being a bit more direct in that area and giving ourselves some more options. “Our discipline had an impact on us. Some of our contact in defence was loose, so you end up knocking the ball loose rather than knocking the player backwards. “There are some technical things we need to do, but our attitude and the way we dug in was very encouraging. “Potentially, that can do us the world of good, if we learn from it. “I think we will; we’re an intelligent team and we do learn those lessons. Although Fax trailed just 13-6 at the break and 17-12 deep into the second half, most of the damage was arguably done before the interval, with Rovers dominating possession and field position. “Featherstone deserved to win, especially with the amount of possession and position they had in that first half,” admitted Marshall. “We couldn’t manage their key backs at all, I thought Taulapapa and Hardman were dangerous all night. “But we made it a contest and didn’t throw the towel in and I’m immensely proud of our efforts; if Shane Grady catches that high kick late in the game when we’re five points behind then it all changes.